When you're ready to enjoy the benefits of a facial treatment, turn to Hand & Stone in Waukesha, WI. 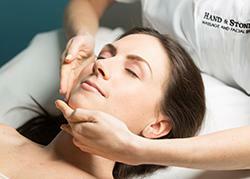 We believe facials can be a great way to exfoliate, moisturize, and cleanse skin. If your skin is showing signs of damage and you're looking for an affordable means of revitalizing it, one of our treatments may be precisely what you need. For a spa that offers a friendly, welcoming atmosphere and phenomenal treatments, come to Hand & Stone. We would love to design a special spa day and help you enjoy the luxurious pampering you deserve. Be sure to ask about our enhanced, signature facials. To schedule your visit, give a helpful member of our staff a call today. We also accept walk-ins for clients from the Waukesha area.